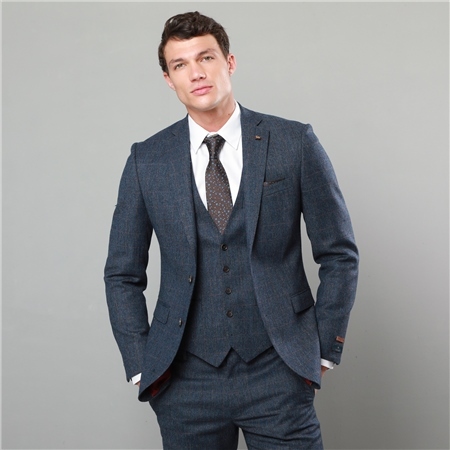 A contemporary blue 3-piece suit featuring a rust check throughout. This luxurious pure new wool cloth is designed and woven in our mill in Donegal, Ireland. Style with a classic white shirt with a matching silk tie and pocket square. Jacket - 2 button, 4 button cuff, double, jetted straight flap pockets, outer breast welt and side vents. Waistcoat - 3 welt pockets. Trouser - belt loops, slant side pockets, double jetted hip pockets and zip fly. Jacket centre back - 74.5cm on a size 40R. Dear Sir or Madam, I bought the suit SFTVPA18P6 cloth no 0043067 in size 38/32 R at your shop in Dublin and was wondering if I could order an additional pair of trousers separately. Kind regards, Andreas Buchin. I'm interesting in the suit, but the trousers are loo large. Is it possible to get a 44 inch jacket with 36 inch trousers (short)?